Compiled with Code::Blocks and openFrameworks with the ofxCvHaarFinder addon. The source of the test can be downloaded here. 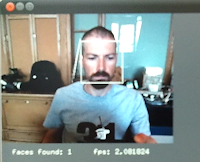 Here is a video of the screen with webcam capture resolution 320x240. And here with webcam capture resolution 160x120. Here is a test capturing at 160x120, but with the haar finder set up for a minimum blob size of 16x12px (the bigger minimum blob size, the faster the detection, with the loss of detection for small/distant faces). The code is rendering the result via SDL on the framebuffer. The gdm was shut down before running the application. Many thanks for your reply. I tryed with the 3.k kernel (on kubuntu) and it didn't work. I'll try with an old ubuntu distro (Maverick for example ;)). I let you know.